Therapeutic horseback riding, also known as Equine Assisted Activity or Adaptive Riding is for individuals with a broad range of physical, emotional, cognitive, and social disabilities. Learning on horse back is fun! 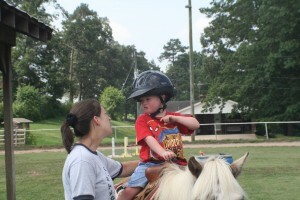 Most of the time, children do not realize that they are learning useful skills besides how to ride the horse! The rhythmic and repetitive movement of the horse mimics the natural movement of a persons hips as they walk. Using this movement on top of a horse naturally turns a persons hips and pelvis, encouraging the rider to sit up straight, and move in a rolling motion. But using horses in therapy can help improve more than just mobility, posture and balance! A camp director that is certified in CPR/First Aid will be in attendance at each camp. Each camper will learn how to take care of their own horse by cleaning stalls, brushing, tacking up and building a relationship with his or her very own horse for the week. We will enjoy horse related crafts and team building activities. Each day we will also spend a lot of time on horseback, learning how to maneuver the horses through certain obstacle courses while improving core strength, gross and fine motor skills and learning patience and direction following. To learn more about EAGALA click here. Equine assisted psychotherapy pairs a qualified team which consists of a client, the licensed mental health professional and an equine specialist. 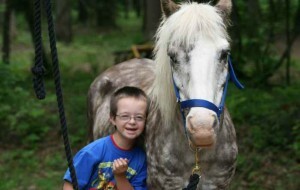 This type of psychotherapy incorporates the use of an equine into the sessions. The clients do not ride on the horses for the sessions, but instead work the animal around on the ground by putting them through different obstacles. Equine Assisted Psychotherapy is experiential, meaning that the clients are given the opportunity to learn about themselves through the sessions. The group then has the ability to discuss the session, observe behaviors of themselves and the horses and then realize different patterns that they may be making and how to better cope with specific situations in their every day lives. Individuals who can benefit from EAP are people with PTSD, behavior issues, ADD, substance abuse, eating disorders, depression and anxiety. Horses mirror individual and team energy. They can be used in many different activities to help a person or group of people work through many different scenarios and can improve productivity, communication and employee satisfaction. EAL has been compared to a type of ropes course, only using the power of the horse. The true magic of an equine assisted learning session can be seen well after the team goes back to work and has left the herd. EAL focuses more on specific goals for the individual or group of people. Goals may be better employee performance, learning how to better work in a team setting or learning patience and leadership skills. An EAL group still consists of the mental health professional, the equine practitioner, the horses and the client or group of clients. Sleep Away Camps- Dustin’s Place offers an adventure based, experiential camp for children and adults with developmental delays. Licensed professionals and college seniors who are earning their degree in PT, SLP, OT, Music or Psych are on staff daily and working with our campers. 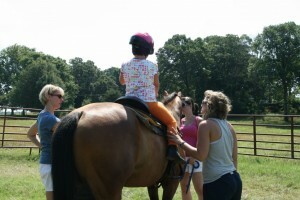 Specific goals for each child are met by experiential play and equine work. Set on a 200 acre working cattle ranch in Clarkrange, Tennessee, campers will have their own horse to care for through the week, sleep in male and female divided bunk houses with male or female staff in each room. Our 2:1 camper:staff ratio ensures our ability to give individual attention to each camper. Improving small and large motor skills by stomping through the creek, playing baseball, blow darts, scavenger hunts, building bonfires and making crafts for the petting zoo and wildlife. Your child will join in stories of Bigfoot and great Native Americans as we build a wonderful world of magic and mystery by being able to touch and see nature, all while secretly building on the goals set before camp by the parents, therapists and your child’s school. First ever in the area! Have you ever seen the middle and high school equestrian riding teams, going to shows, dressing up fancy, working as a team and doing things together that they all love? We do that too! Athletes must meet requirements for lettering and to apply for our letterman jacket program. Gold Level- For $500, you get an engraved plaque posted on display on the sponsor wall at our farm. Autographed picture of our team to display at your work site or home. Logo on all banners posted at our shows. Name and logo posted on sponsors page on website. Personal thank you on all of our social media. Silver Level- For $300, you get an autographed picture of our team to display at your work site or home. Logo on all banners posted at our shows. Name and logo posted on sponsors page on website. Personal thank you on all of our social media. Bronze Level- For $150, you get Logo on all banners posted at our shows. Name and logo posted on sponsors page on website. Personal thank you on all of our social media.